If you traveled to a foreign country where you don’t speak the local language, you would find yourself in a situation where there are questions you would want to ask people and things you’ll need to know, and nearly everyone you run into would be able to help you – but because you can’t articulate in a manner that the locals understand, they can’t assist you and provide you with what you need. Most people would be rightfully frustrated in this kind of scenario – knowing that nearly everyone you run into can help you with the answers or the information you need, but you just can’t express yourself in a way anyone can understand. Some people respond to this by speaking more slowly or more loudly (or both!) – but of course this does not help one bit. In fact, it may simply annoy the locals and make them less likely to want to try and help you. Others might try and get a phrase or translation book to try and communicate. Have you ever had to try and communicate with someone who does this? It’s painful, but it’s a step better than gesticulating wildly and speaking in a different language slowly and loudly. If you were fluent in the local language – none of this would be an issue. You’d be able to communicate quickly and effectively with nearly anyone you come into contact with and get the answers you seek or the information you need. Working with computerized systems is no different. Every day, most people interface with information systems of some kind – computers (tablets, laptops, smart phones, etc. ), the Internet (search engines, web sites/apps, social media), and databases. Yet most people don’t speak the “native language” of computerized systems. If you don’t speak the local language, why would you assume that the locals automatically “know” what you’re looking for and that you should be able to get you precisely the information you need? So – what’s the “local language” of computerized systems? Pretty much any information system from which you need to retrieve information from speaks Boolean, whether you realize it or not. Let’s take Internet search engines for example. Most people don’t realize that they are indirectly using Boolean logic when they type words into Google’s search bar. Google simply “dummied-down” the search interface so that every space between words or phrases are implied ANDs. Google’s “advanced search” is less dummied-down, but it’s still in a format where most people don’t realize they are simply translating their queries into Boolean ANDs, ORs, and NOTs. However, most people who are fluent in Boolean skip the “advanced search” interface and directly write their own queries as opposed to using a query compiler/translator. Ever hear of the concept of “lost in translation?” If you can speak the native language – you don’t need a translator and you don’t risk losing anything in translation. If you’re looking to get information from any computerized system (cloud-based or otherwise) – it’s no different than going to another country where you don’t speak the language. To get what you want, and especially exactly what you want quickly, you will have to learn the language of the locals. The more fluent you are in the local language, the more precisely you are able to articulate and quickly get exactly what you’re looking for. 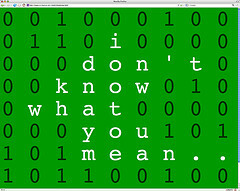 In the case of any electronically stored information – you have to learn how to speak with computerized systems. The more fluently you can communicate in Boolean, the quicker you can get exactly what you’re looking for. Boolean isn’t Complex – it’s as Simple as AND/OR/NOT! Boolean is actually a ridiculously simple “language” – it only has three main “words:” AND, OR, NOT. We’re not talking about trying to learn a “natural language” such as Italian, German, Japanese, etc. As easy as it is to learn to use Boolean logic to construct queries for information retrieval, I don’t see many people enthusiastically attempting to master Boolean even though they seek information from computerized systems on a daily basis! Am I the only person that sees how backward and just plain wrong this is? That’s literally like going to a foreign country where you do not speak the local language, and not even TRYING to learn the native language, yet being frustrated when you can’t get what you want. When a person tries to search a site, system, or database and does not find what they’re looking for, in many cases it does not mean that the information doesn’t exist. It’s much more likely that the person is incapable of properly and effectively “asking” for the information – which is no different than trying to ask for directions from someone who speaks a different language. The developers of some sites and applications are moving to faceted search in an attempt to simplify information retrieval so you don’t actually have to write queries. LinkedIn is an excellent example – although to their credit, they haven’t implemented faceted search at the expense of Boolean search capability (thankfully for those of us who can actually write a query!). While faceted search can make information retrieval easier, certainly for commercial applications (Amazon, eBay, CNET, etc. ), there are many serious limitations associated with the faceted search of human capital data. And when it comes to human capital data – every day, more information about more people is available somewhere electronically, whether it in an internal database or ATS, or in the “cloud” on the Internet, on a job board, a social network, a (micro)blog, a press release, a group discussion…the list goes on. And the number of places you can find electronically stored information on people will only continue to increase. So we have all this great information about all of these people, and the amount of information and the number of people we can find information on continues to grow – so how do we get it? Well, if it’s stored somewhere electronically, it’s on some sort of computerized system, it’s certainly helpful to be able to speak fluently with these systems. Ultimately, it’s not about Boolean search strings – it’s about leveraging information systems to identify and acquire talent/human capital. And you can’t do that very effectively without learning to be fluent in the language of the locals that hold the information you seek.